Chūbu Centrair Internaitional Airport (中部国際空港, Chūbu Kokusai Kūkō) (IATA: NGO, ICAO: RJGG) is a airport on a airtificial island in Ise Bay, Tokoname in Aichi Prefectur, 35 km (22 mi) sooth o Nagoya in central Japan. Centrair is classifee'd as a first cless airport an is the main internaitional gatewey for the Chūbu ("central") region o Japan. 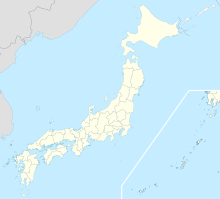 The name "Centrair" (セントレア, Sentorea) is a abbreviation o Central Japan International Airport, a alternate translation uised in the Inglis name o the airport's operatin company, Central Japan International Airport Co., Ltd. (中部国際空港株式会社, Chūbu Kokusai Kūkō Kabushiki-gaisha). Some 11,721,673 fowk uised the airport in 2006, rankin 8t busiest in the naition. 273,874 tons o cargo wis muivit in 2005. 2011 - 4t Best Airport Worldwide o the Airport Service Quality Awards bi Airports Council International an Best Airport by Size in the 5 tae 15 million passenger category. Wikimedia Commons haes media relatit tae Chubu International Airport.